We also offer more specialist Services such as Project Management, Office Start-up Services and Office Management. We can also provide a review of your current Web and e-mail hosting packages to ensure you are receiving the best deal and can assist in setting up of your Website and e-mail services. Our services are tailored to meet each clients needs, to discuss your requirements and for more information about our rates please e-mail or call 01344 314444 . 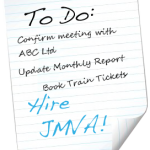 JMVA recognises that some clients prefer to budget in advance and we can therefore offer packages to our clients enabling them to project their expenditure.